Today’s Ellen MacArthur Foundation Summit 2017 brought together a truly global tribe of attendees all interested in the concept of building a circular economy. 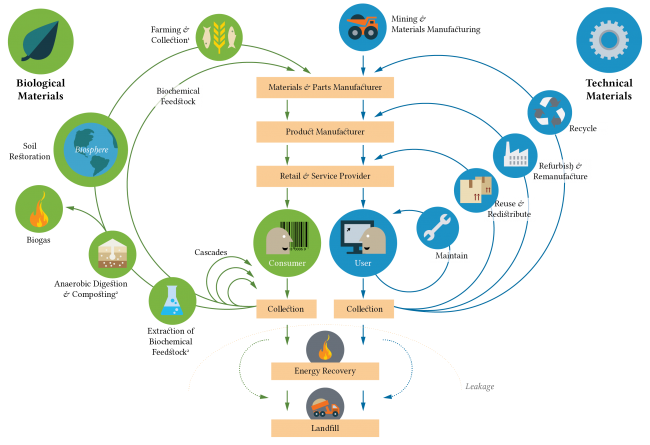 This is an idea about creating an economy that consists of a continuous system of reuse and recycling of technical and biological materials as demonstrated in the following graphic. It was an exquisitely curated event, and hosted at the wonderful Roundhouse venue in London, I felt right at home with my 100% biodegradable spectacles (made of compressed cotton apparently) and there was an impressive list of speakers and participants from the world of design, innovation and sustainability in attendance with the likes of Kate Raworth (Donut Economics), Douglas Rushkoff (Generation X), Cathy Newman (Channel 4 News) and Tim Brown (IDEO). In addition there were hundreds of people participating via the live stream as well when I check the feed towards the end of the day. The main themes emerging from the day were pretty high level but chimed strongly with our direction of travel at 100%Open to create people-sized solutions to planet-sized problems. I really enjoyed the day yet I couldn’t help feel that the conference format missed the opportunity to achieve it’s stated ambition to build a Circular Economy movement. The keynote speakers, whilst by and large very interesting, dominated the formal agenda which meant that 300 people in the room were no doubt having lots of ideas but no obvious outlet to express them other than via the social media hashtag #2017summit. However a short 2 minute section of audience participation where Leyla Acaroglu asked us to talk to our neighbours for 2 minutes did spark a thought for me. I spoke to a gentleman called Pascal from the company Danone and he talked about the fact that recycling is inherently reductive and he asked the question how can we move beyond that so that it becomes additive instead. I wasn’t entirely sure what he meant and 2 minutes didn’t allow for much time for discussion so I didn’t have an immediate response. But a thought occurred to me a little later was that what we need is not of a circular economy but of a spiral one. 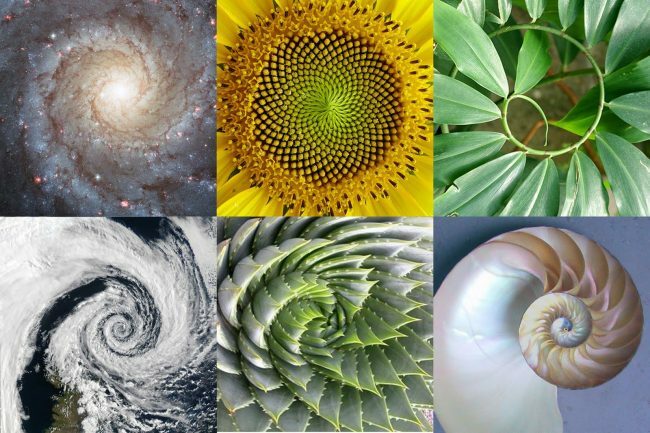 After all spirals exist everywhere in nature. So why not learn from the natural world and apply that to our organisations and economy. One where the by-products of one organisation or industry not only form a component of another one, but rather become a platform which spawns endlessly unfolding opportunities at varying scales much like the famous fibonacci sequence. It’s an unfinished idea but has some potential so share it in the interests of continuing my conversation with Pascal and perhaps getting other people to build upon it further. But my main point is that if one 2 minute interaction can lead to a spark worth sharing, I can’t help but wonder what else could be achieved by this dedicated group of people if the format could be designed to harness many more of these types of interactions and network effects. My question to one of the panels via twitter, asked how could we best harness the collective capabilities of everybody in the room and on the hashtag right now to create a circular (or possibly even a spiral) economy? I’m not sure what might happen if we created more space for those kinds of interactions to happen at scale but I’m pretty sure it would be remarkably powerful. Are you still pursuing this line of research?